Asus launched a new Android tablet in Indian market that named Asus MeMO Pad ME172V. The tablet has 7 inch LED display with the 1024x600 pixels of resolution and it supports 10-finger multi-touch also. It runs on Android 4.1 Jelly Bean operating system and powered by 1 GHz processor. Asus MeMO Pad features with 1 GB RAM and it comes with 8 GB and 16 GB interal storage. You can extend the memory via using microSD card up to 32 GB. There is 1 Mega Pixel front facing camera only for making video chats and taking photos. 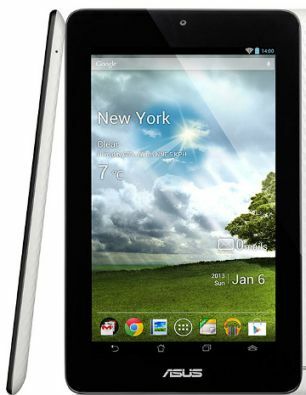 The tablet gives 7 hours of batter time it is equipped with 4270 mAh polymer battery. You can get 5 GB Asus online web storage and some apps provided with this tablet such as Supernote, My painter, Buddybuzz and Asus webstorage online office. The tablet is priced for Rs.9999 and it is available now on the stores and online. It comes with three attractive colors such as Titanium Grey, Sugar White and Cherry Pink.